How Does Our Natural Deodorant Work? 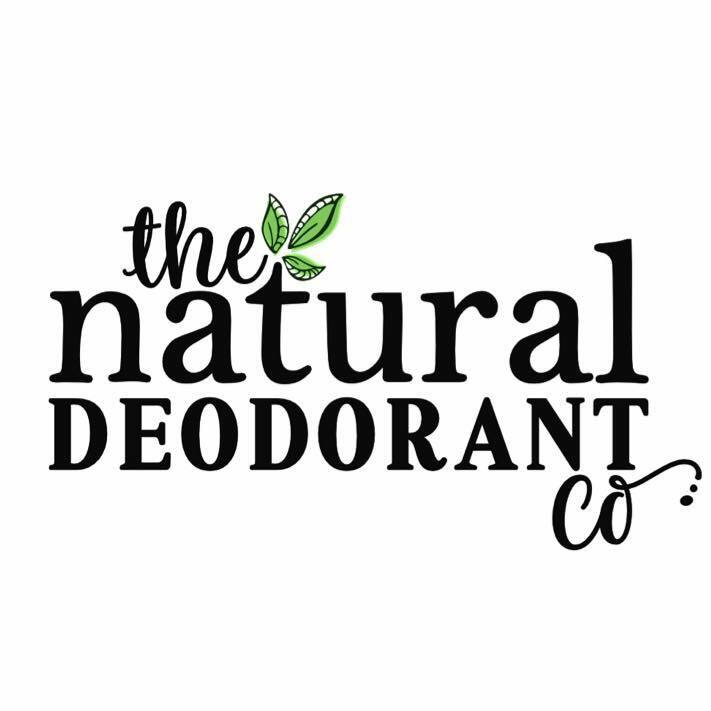 | The Natural Deodorant Co.
Home/Articles/How Does Our Natural Deodorant Work? Every day your body releases sweat from glands under the surface of the skin. At first sweat is odourless and it is made up of proteins, water, potassium & sodium. When sweat interacts with certain bacteria living on the underarm skin it causes ‘body odour’. Depending on why we’re sweating, a different combination of sweat components are released. For example, ‘stressed sweat’ can release different chemicals to ‘heat sweat’. Antiperspirants are aluminium based and use a gel-like substance to block your sweat ducts, preventing or at least reducing the amount of sweat your body produces. Over time our bodies can become accustomed to whichever antiperspirant we are using, so people are told to change them frequently to avoid becoming to immune to their sweat blocking properties. Interestingly, research published in the archives of Dermatological Research show that regular use of antiperspirants can actually lead to more body odour. Deodorants work by eradicating the odour causing bacteria. By killing the bacteria, your sweat has nothing to interact with and no odour is produced. 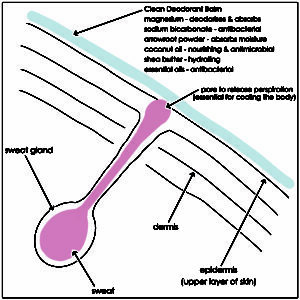 Deodorant does not block pores to inhibit perspiration. Sweat is your body’s in-built air conditioning unit, and is essential for good health. Your 4 million sweat glands enable you to maintain a safe body temperature and sends sodium (salt) back into the blood to maintain salinity in the body. In most deodorants (natural and otherwise) a key ingredient is alcohol. Alcohol is certainly an effective antibacterial (which is why alcohol gel is on every hospital ward), but applying it to your delicate underarm skin on a daily basis is not advisable. Alcohol kills both good and bad bacteria and leaves skin prone to dryness and irritation. Healthy skin is home to a diverse array of flora and we should not attempt to wipe them out entirely. So until quite recently the two most commonly used ingredients in deodorants and antiperspirants were alcohol or aluminium. No wonder so many people struggled to find a deodorant that didn’t upset the delicate balance of their underarm skin! A far better (and more effective) approach is to use gentle antibacterial ingredients in combination. This ensures that the natural skin flora remains in balance and your underarms stay healthy and fresh. It’s ideal for a natural deodorant to contain oils or butters, along with some powders to enable the deodorant to be absorbed gently into the skin with our being abrasive. Dry deodorant sticks and powders can leave skin irritated and sore. Each of these ingredients has been proven to effectively kill odour causing bacteria on the skin. Coconut oil also has the added benefit of being able to reach the dermis (deep layers of the skin) allowing the antibacterial action to begin under the surface. Our deodorants are designed to be applied by hand because this is the most effective way to deliver long lasting deodorising results. Imagine applying a stick of face cream- it wouldn’t be able to do its job very well sitting on the surface of you skin, would it? By using your fingertips the moisturising ingredients are massaged into the skin, keeping it healthy and soft, and the active ingredients such as arrowroot, magnesium oxide and sodium bicarbonate provide effective antibacterial coverage on the surface. Used correctly our deodorant balms and creams absorb instantly into the skin and leave a light powder finish without ever feeling dry or sticky. Why Doesn’t Natural Deodorant Work For Me? You haven’t found the right one yet! We offer sample sizes in all of our products because we know how hard it is to find a natural deodorant that works and we’re confident that once you’ve tried them, you won’t want to go back to your old deodorant or antiperspirant but remember to use your samples for 5-6 days to really get familiar with your new product. Our sample sizes last approximately 6 days. Side note: It can occasionally take a few weeks for natural deodorant to ‘work’.Some people experience a settling period while their body adjusts to being able to perspire naturally. They may sweat slightly more in the first week or so, but this subsides quickly. We find this only happens in about 10% of people. If you have been using antiperspirant it may also be that the aluminium gel is leaving your pores since this is not washed off in the shower like you would expect. The way sweat smells can also differ from day to day based on diet, skin pH, alcohol consumption, stress and medication. This can make people people worry that their favourite deodorant has stopped working for some reason but this can usually be attributed to one of the factors mentioned above and will return to normal.